Yep, I'm a bit scrappy. My shack is a corner of a desk in my workshop, which is primarily a haven for my woodworking passion. My small shop is so full of woodworking tools that there's not a lot of free space, so I have to make use of every cubic inch, for example, the monitor I use with my Raspberry Pi is perched (securely) on top of the water heater next to my desk, and a phonetic alphabet chart is taped to the side of the water heater. Hey, it all works! 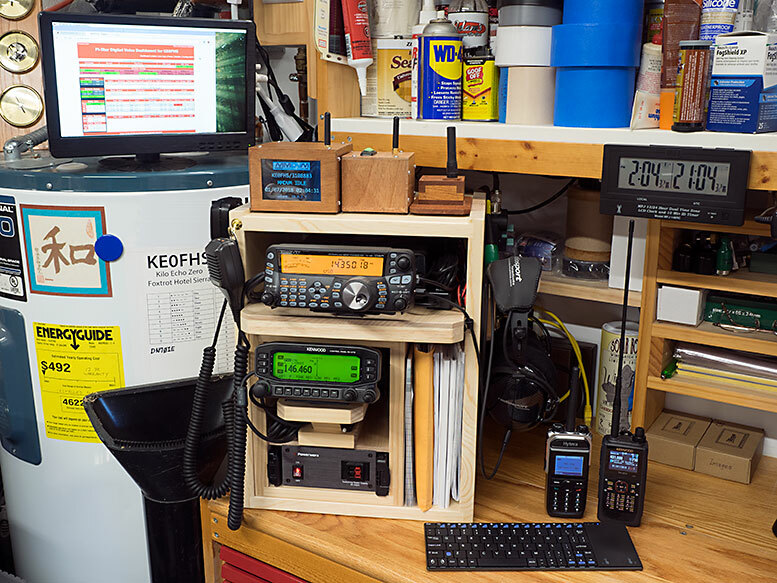 While I'm scrappy about fitting my amateur radio station into my woodworking shop, I'm not scrappy about my equipment, and always look for quality components. 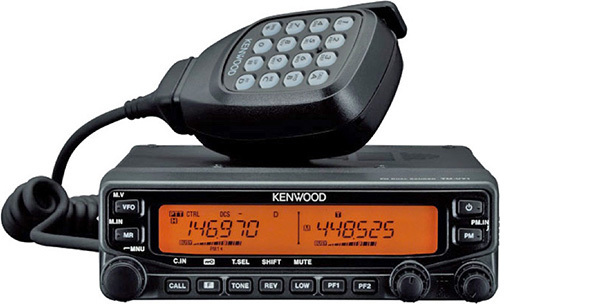 VHF/UHF – Dual band Kenwood TM-V71A△ with an RC-D710 control panel for APRS. It's a good base station for my purposes, given my focus on local-area emergency communications. D-STAR and DMR – Kenwood TH-D74A and AnyTone AT-D878UV via a ZUMspot Pi UHF△ mounted on a Raspberry Pi and running Pi-Star△. For details, see: Diving into D-STAR△, Discovering DMR△, and Hanging out with hotspots△. HF – Kenwood TS-480SAT△. Not using this much yet as I haven't figured out a good antenna solution, but keeping it on the back burner as a project to tackle. Comfort zone – I find the Kenwood approach to key and menu layout more intuitive to understand than some other radios I've tried, and I'm happy I need to learn that basic approach only once. Computer – Raspberry Pi 3B+ with an Elecrow 12″ LED display and a Stellar Labs wireless keyboard with touchpad. In the photo, you can see the monitor perched on top of the water heater (attached with velcro), though in real life the colors look much richer. 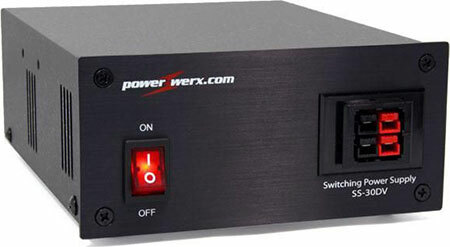 Power supply – Powerwerx SS-30DV△ 13.8 Volt 27 Amp Desktop DC Power Supply, Keeps everything nice and smooth, even when our mountain power up here is acting finicky. I use a lot of various parts and components from Powerwerx△, including Anderson Powerpole parts. Good company. Speakers – I mounted two of the optional Kenwood KES-3S speakers—which provide crisp, clear audio with good volume that I can hear throughout the shop—up high above the radio, one on each side of the shelf that's above the desk. 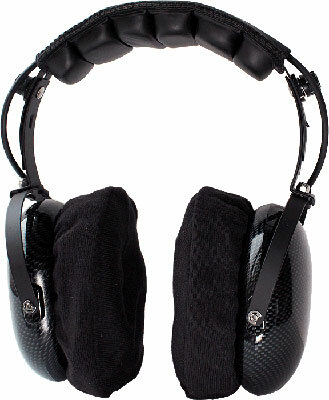 Headphones – Radiosport RS20S△ from Arlan Communications. Comfortable! Behind the scenes – I use switches, adapters, connectors, etc. from American Radio Supply△. You name it, they've got it. 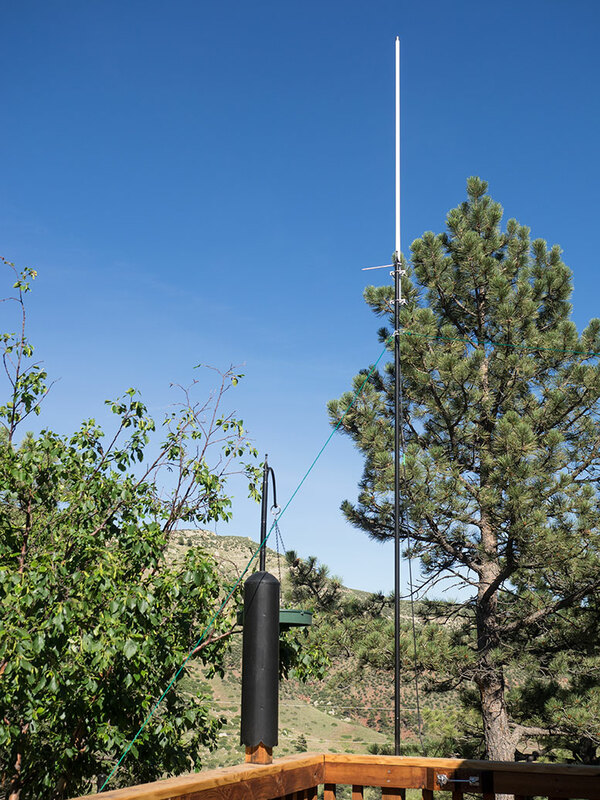 We basically live on top of solid rock here in the foothills of the Rocky Mountains, which makes it crazy difficult to install a ground pole … pounding something into the ground one foot is nearly impossible, let alone eight feet! So I decided for the time being to put up an antenna only when there's no chance of lightning. I temporarily mount the antennas above my deck, sitting atop a 7′ pole that rises from a mount attached to our deck. It takes me just a few minutes to mount or dismount the antennas using this system. For VHF/UHF, I use a Diamond X50A△. For the MURS radio that I use for emergency preparedness, I use a FireStik MURS 5/8 Wave Base Antenna△ mounted at a different position on our deck. I use a strong 1″ tubular steel pole made by Erva (designed for bird feeders) to mount the antennas. That gets the base of the antennas up about 14′ above the ground. Pole: Erva Long Poles△, with Double-swaged Connectors△. Mount (attached to 4′×4′ deck post): Erva WMT Wall Mount Pole△. Guy lines: Paracord cinched with Nite Ize CamJam XT Aluminum Cord Tighteners, which are amazing. 60 - 70 MPH gusts ripping down from the Continental Divide are common here, and this combo does the job. I use an 8″ UHF-Female SO-239 Bulkhead Coaxial Connector△ to bridge the wall between the exterior and interior of my workshop. Although, as I mentioned before, it's basically impossible to drive an 8' ground pole into our rocky ground here, I have been able to drive a shorter pole a few feet into the ground near this spot. As an extra measure of protection, I added an OPEK LP-350B - Arc-Gas Lightning Transient Voltage Surge Protector△ inline tied into that ground pole. 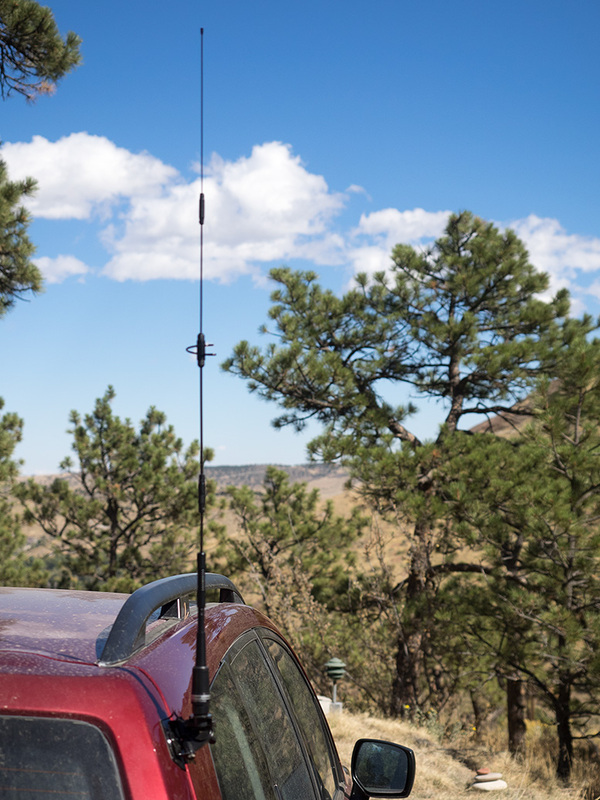 I'm not relying on it for full lightning protection—I still pull my antenna down whenever there is a storm brewing—but hopefully it does provide an extra ounce of protection for the unexpected. 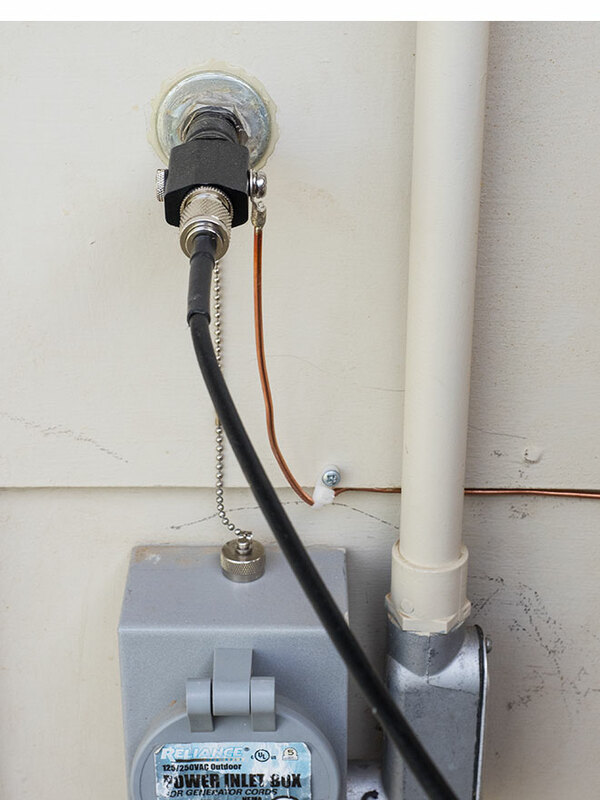 By the way, that bulkhead connector in the photo is just above the power inlet for our Generac LP5500 propane generator, another emergency preparedness item we added since the flood. 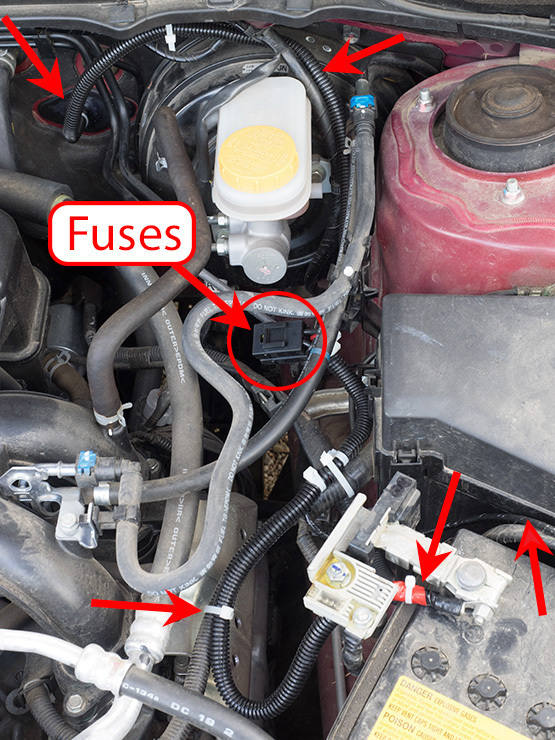 It connects to an auxiliary fuse panel that powers all our essential circuits (well pump, refrigerator, furnace, septic system, and of course, the circuit my ham radios are on!). We're pretty happy with it. We like keeping propane around rather than gasoline, and already it has gotten us through a couple power outages very nicely (mountain power can be a bit unreliable at times!). I'm not much of a car guy, so I'm pretty satisfied with (and a little surprised by) how well the installation of the Kenwood TM-V71A△ into my 2015 Subaru Forester turned out. It was a bit of long, strange trip to get to this point. In fact, I had intended to have the radio installed professionally, but apparently that wasn't in the cards. My regular car mechanic shop wasn't interested in the job, so I thought about using a local branch of a car stereo installation chain shop, but the online reviews they have received are so awful that I was scared away. Finally, I found a custom car audio installation shop that had good reviews and told me by phone that they were willing to do and had experience with a ham radio installation, so I went in to talk to them about it. It was a bit of a drive to get to them and their charge was definitely on the pricey side, but I figured it would be worth it for a job done professionally, so I made an appointment for two weeks later. On the morning of the appointment, I drove my car there again, and a friend drove there as well, to give me a ride home. We arrived on time for the appointment, and then waited and waited, but nobody showed up to open the shop, and nobody called or texted me to explain why they were so late. After a long, boring time, I decided that it probably wasn't a good idea to have my radio installed by a shop that would treat a customer that way, so we left. I wasn't sure what to do next, but when I asked a local Elmer for an installer recommendation, he convinced me I should try to do it myself. It took me a lot of hours and sweat spread out over three days, and I ended up with scrapes and cuts all over my hands, and with my body bruised and feeling as sore as when I take a long, steep hike up in the mountains. I'll also confess that I cussed at the people who design cars more than a few times. But I got the job done, and in the end I'm glad I did it myself. Working on a car is like doing plumbing: there's seldom enough room to maneuver, you often don't have enough hands, half the time you can't see what you're doing, and you have to contort yourself in ways that are just shy of impossible. Ah well, at least there's no water running through the antenna cable, just waiting to leak all over the place the first time you turn the radio on after hooking it up! The radio's front panel and the companion KES-3S speaker fit nicely into the cubby hole in the Forester 2.5i's center console. I hung the front panel from the top of the cubby using the DFK-3D remote kit, and I mounted the speaker to the floor of the cubby using the bracket that came with it. The microphone hanger fits nicely into an indentation on the outside passenger side of the console, which is perhaps a spot designed for an additional speaker in an upgraded version of this car. Kudos to Kenwood for providing a quality mic hanger with this radio, which holds the mic firmly in place. 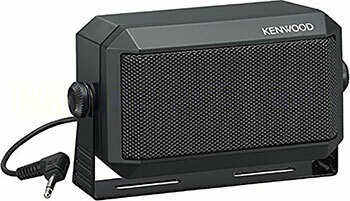 By the way, using the KES-3S external speaker really improves the sound quality, not to mention letting you put the speaker where you need it (rather than, for example, under the seat where the radio's main body ended up). In my shop I use the same model radio for my base station, and also use KES-3S speakers mounted up high with that, which provide crisp, clear audio with good volume that I can hear throughout the shop. 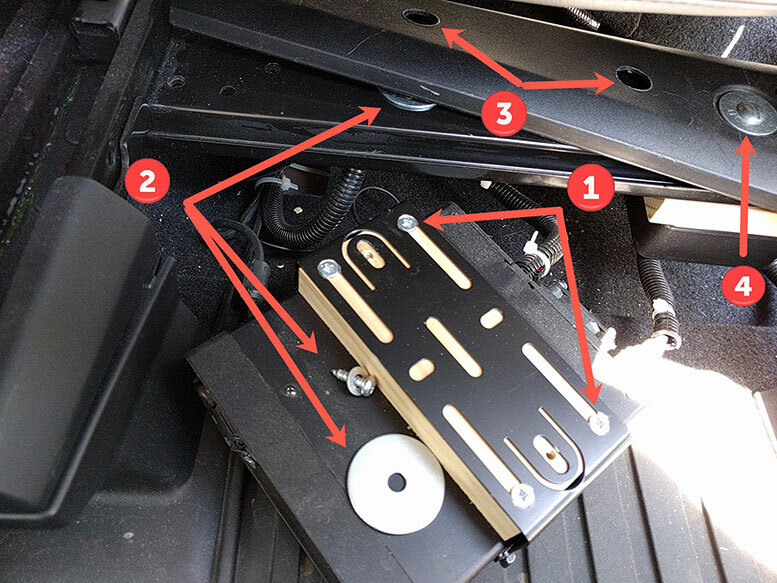 I was able to gain access to some hollow space in the center console by popping off the two plastic gray pillars at the front of the cubby hole, which then enabled me to pop up the black plastic cover surrounding the shifter assembly. I mounted the radio's main body under the passenger seat by hanging it from a steel bar that runs between the seat runners (I'm guessing that bar might be there for mounting the motor that controls seat movement on models with power seats). I attached the radio bracket to a piece of ¾″ pine. I trimmed the pine lengthwise so it would fit up into the space in the seat bracket. Fortunately, the radio bracket already was the right width to fit up in there. I attached the radio bracket to the pine with ½″ wood screws. There were already several large holes in the seat bracket where I wanted to attach the radio (for passing wiring up through?). I put big washers on top of the seat bracket, under the plastic cap. That way, I could use wood screws to screw down into the piece of pine beneath the radio bracket. I drilled a couple holes in the seat bracket's plastic cap so that it would fit down over the round heads of those screws. Finally, I attached the plastic cap in place. There were already indentations in the plastic cap for a big washer and smaller holes through the metal seat bracket beneath those, so I was able to use ordinary short bolts for that. Here's the view of the radio's main body from the rear seat. I glued the ferrite choke that's attached to the cable that runs to the front panel onto the radio's main body to prevent the cable from getting accidentally snagged by a passenger's foot. 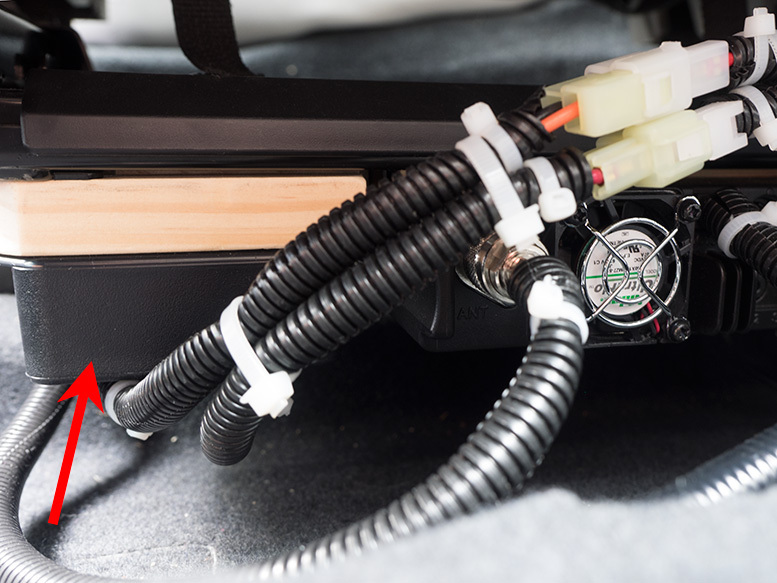 The power cable attaches directly to the car battery and then runs through the engine compartment and into the passenger compartment. 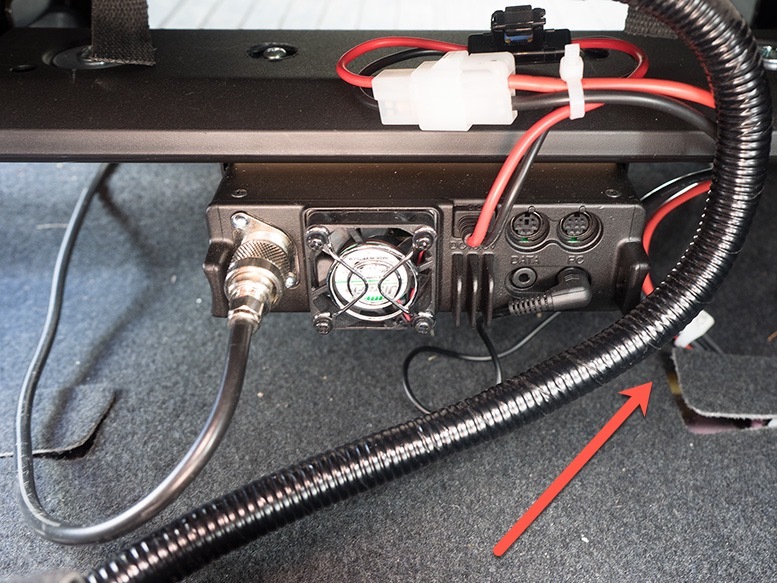 I wrapped the exposed wires with wire sleeve (aka: split wire loom or convoluted tubing) that I picked up in the automotive section of our local hardware store, and then secured it all with zip ties in a way that keeps it away from any hot parts of the engine. 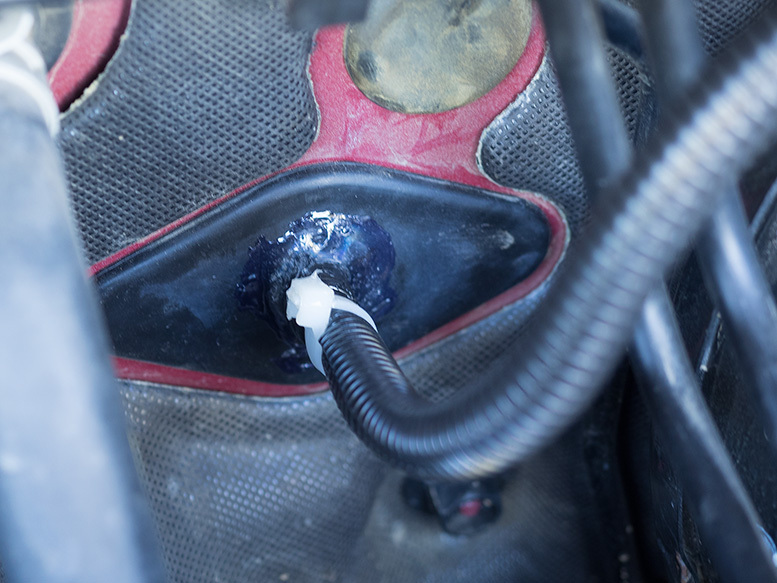 I ran the power cable into the passenger compartment through an unused diamond-shaped rubber grommet labeled LH that covers an opening in the bulkhead where, for a manual transmission model of this car, the clutch master cylinder would be mounted. I sealed the slit I made with GOOP. That opening enters the passenger compartment just above the gas pedal assembly. I ran the cable from there to behind the carpet that is mounted up onto the center console, and then into the center console. 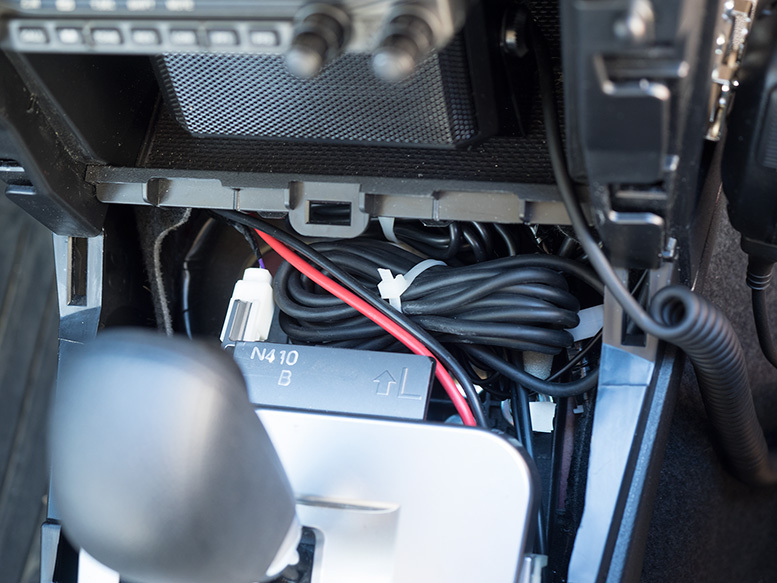 From there, it joins the other cables that run under the carpet on the other side of the center console and to the radio's main body. I mounted a 40″ Comet-NCG CA-2x4SR antenna△ (with spring) to the passenger side of the rear hatch with the Comet-NCG RS-730 mount. This is the one thing I'd do differently next time. I think it would've been better to mount the antenna on the driver side of the car where it would be in the middle of the roadway, as I've already hit a few branches overhanging the passenger side of the road. Live and learn! I think what I'll do to solve this is to install the shorter 27″ Comet-NCG SS-680SB antenna△ for normal day-to-day use, and reserve the CA-2x4SR antenna for times when I need stronger and wider coverage. This was another step that took a long time and a lot of sweat! 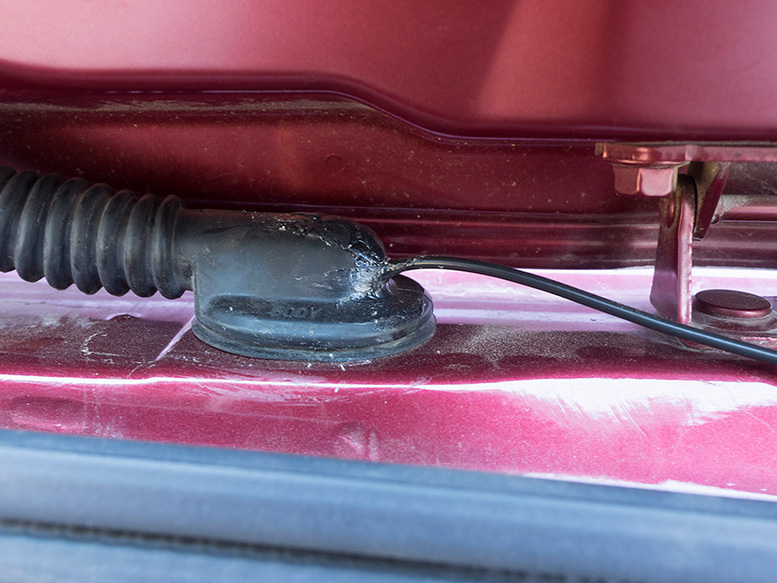 I ran the CK-3M5 antenna cable into the roof space through a slit I cut into the the center brake light cable boot (again, resealed with GOOP). From there, I ran the cable down the pillar behind the rear window and along the side panel to beneath the rear seat. Then I ran the cable through the frame beneath the kick plate for the rear passenger door and into the floor space next to the center pillar. Finally, I brought the cable up into the open space beneath the front passenger seat just in front of where the rear of the seat runner is bolted to the floor, where there is an opening in the carpet. A couple weeks later: Well, after knocking the longer antenna on low-hanging tree branches a few more times, I went ahead and installed the shorter antenna. But after knocking even that one on roadside branches several times, which can make a fairly shocking sound, I decided I simply had to bite the bullet and fix my mistake. Fortunately, there was some excess antenna cable under the rear seat, and I was able to pull that back to the rear of the car fairly easily. I cut the GOOP seal on the cable boot and pulled the cable through. There was just enough extra length so that I could mount the antenna down a bit lower on the driver-side of the rear hatch. With this configuration, I can now keep the 40″ Comet-NCG CA-2x4SR antenna mounted all the time. Because the radio is connected directly to the car battery, the radio can be on when the car is off. After using the radio for a couple of weeks, I realized that I was a bit nervous at the prospect of forgetting to turn it off when I turn the car off, possibly causing the battery to completely drain. 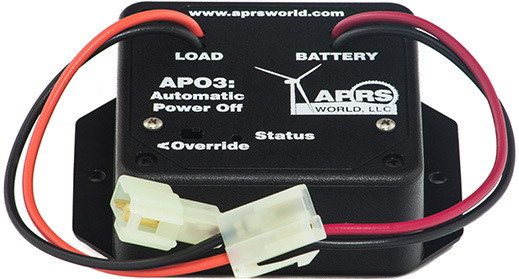 Fortunately, while researching APRS, I came across a product made by APRS World called APO3 (Automatic Power Off 3)△, which does just what its name implies: shuts off the power to the radio after the car is turned off. 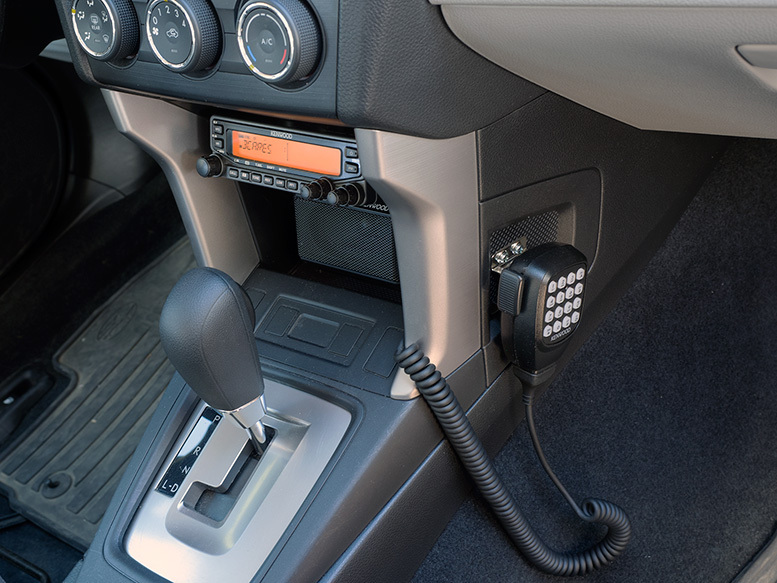 The device has a variety of settings for how long after the car is shut off that it shuts the power to the radio off. The default is ten minutes—in order to give the radio enough time to send one final update if APRS positioning is enabled—and that works fine for me. It even has an override switch to enable using the radio when the car is off. 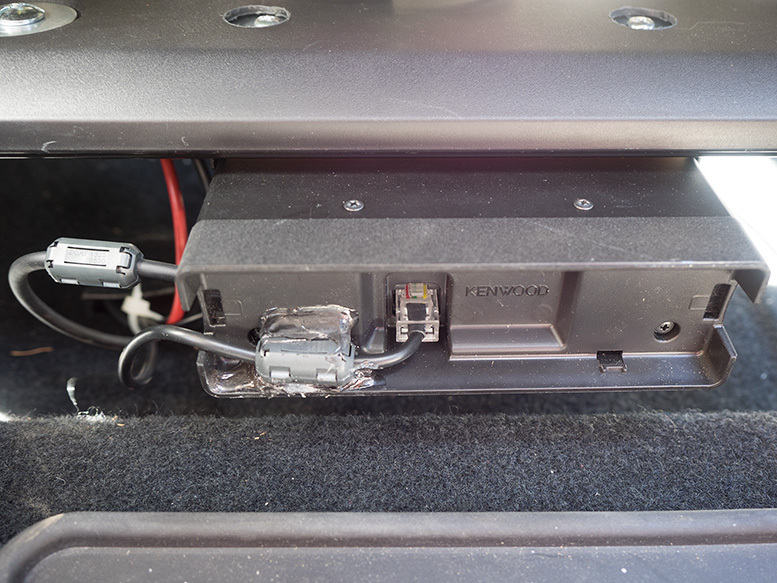 The black box is small enough that I was able to put it under the seat right next to the radio itself, mounted via a scrap piece of pine to the same steel bar, so everything remains up off the floor and tidy. Because I was working under the seat in an area that was even more confined because of the radio body that was already there, mounting it was a royal pain, but with enough time and fumbling around I was able to get it securely attached. I also went ahead and wrapped all the cables with wire sleeves just to give them an added bit of protection. 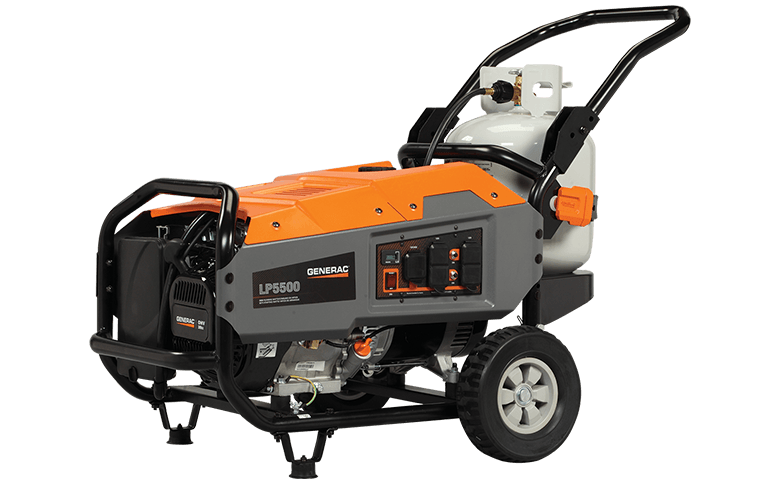 By the way, I've since learned that Powerwerx makes a similar product: DC Automatic Power Switch/Timer△, and it has the advantage of being waterproof and mountable in the engine compartment. One of the more challenging tasks I had to do related to this install was driving one of the screws that attached the APO3 to the piece of wood I mounted it to. The challenge was that it was in a tight spot where I couldn't see and had little room to maneuver, and I had only an old, cheap 1/4″ ratchet. I did get it done, but it took me a stupid long time and a lot of needlessly frustrating effort. It was difficult enough to get the screwdriver bit to fit into the screw head, but then when I started tightening, two things kept happening: either the ratchet would go into reverse because I was exerting upward force on the ratchet head to keep it engaged with the screw head and kept accidentally turning the direction changer, or the screwdriver bit would fall out of the socket. Argh! Thinking about it afterwards, I realized that my design was flawed (if I ever have to take it apart, I'll put it back together differently), and also I didn't have the right tools for the job. At least there's an upside to that, right? It's a chance to get some new tools! I decided to get two things: a better quality 1/4″ ratchet and an adaptor to hold the screwdriver bit. As I was searching for a better 1/4″ ratchet, I stumbled across a tool that caught my interest, the Milwaukee M12 Cordless 1/4″ Lithium-Ion Ratchet△. I was a bit skeptical, but if it proved to be a good tool, it could be really useful in situations where there's not much room to maneuver, so I decided to give it a try. Turns out it's a great tool, compact enough to get into tight spaces, yet still tough enough to provide decent torque. In a very short time, it became one of my favorite tools, especially when paired with a Wera square-to-hex adaptor, when it becomes a much more compact and versatile right-angle screwdriver than my full-size Makita 3/8" angle drill. I've used it many times since; it turns tasks that otherwise would have been a bit awkward into something quick and easy. The Wera 042750 1/4″ square to 1/4″ hex adaptor with quick-release chuck△ is a great little add-on. I've used it in a variety of situations already, both with the Milwaukee M12 and also with hand ratchets. I thank my lucky stars that I have it every time I need to drive a screw with a ratchet. Speaking of ratchets, I did find a better designed manual 1/4″ ratchet as well: the Heyco 60145 1/4″ Reversible Ratchet Varicat 32 Tooth. It has a toggle to change between forward and reverse, so in a tight space, you can exert force on the head without accidentally switching direction. Life is good!